The Shelby and Ferne Collinsworth School of Music’s ensemble, Worship Collective, has recorded a Christmas album. The School of Music is partnering with Prism Music and Tommy Walker, a contemporary music composer and songwriter, to release the new Christmas album. The ensemble recorded 11 of Tommy Walker’s “Generation Hymns” Oct. 11-12. 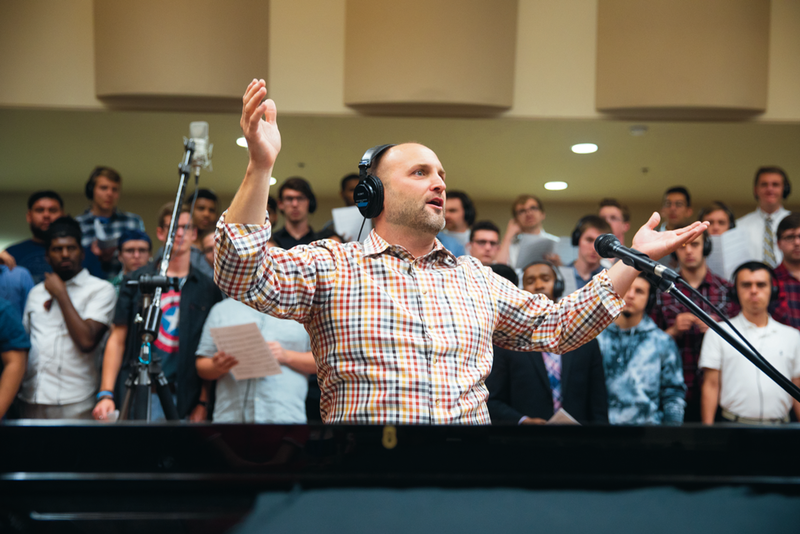 The combined forces of Male Chorale and Women’s Choir came together to make Worship Collective, the ensemble that occasionally sings in California Baptist University’s Chapel. groups in the School of Music. Joseph Bolin, dean of the School of Music and director of Worship Collective, said the goal of the project is to revitalize hymns for which Walker writes new choruses. “The goal of the collection is to take well-known hymns (and) envelope those new choruses in fresh arrangements that can be used for worship in the church,” Bolin said. Bolin said this particular collection of “Generation Hymns” will be a Christmas-themed album produced by Prism music and marketed for a worldwide audience. Jon Pate, senior music education major and vice president of Male Chorale, said recording is an opportunity to positively a ect others. Despite the long hours of recording, Pate said the experience is valuable. “Recording is one of the most educational experiences I’ve been a part of,” Pate said. Bolin said being in the studio teaches students skills. “Students have new experiences in studio environments,” Bolin said. Caitlyn Park, junior piano performance major and president of women’s choir, said she is optimistic and hopeful about the album. Pate recalled the recording environment as encouraging. The new album is a noteworthy chance for the School of Music and to increase the public’s awareness of CBU, nationally. Worship Collective will partner with Harvest Christian Fellowship on Dec. 1 to create a live-video recording Community members are welcome to attend the filming and concert free of charge.